The chances are that the majority of offline UK bettors will not of heard (or not heard too much) about the Victor Chandler company. Victor Chandler is actually a very well established gambling website, that offers sports betting along with other gambling alternatives such as Casino and Poker. Overall, the VC Bet section is good, and offers decent odds from time to time. VC Bet is in the upper tier of betting websites to choose from if you're looking for a good online betting shop. However, I would not say that it is the best overall. The website and odds are decent, but they are not consistently as good as the odds set by bigger betting websites like Betfair and Ladbrokes. Nonetheless, even though you may not have heard of Victor Chandler before, it is still a very decent betting site that is worth browsing over to check out the odds on offer. It wouldn't be my first choice personally, but it's a safe site that is well worth knowing about. As already mentioned, the odds aren't great. However, VC is a solid betting site that I don't mind having a look over if I have some spare time to browse through if I'm looking for the best odds. I have an account there, but in fairness I rarely place any bets. This is not to say that it's not a good site, but I simply prefer betting at other sites where the odds are consistently better. Victor Chandler Betting Shop Website Design. A sweet design that looks great. It's not the easiest to use, but the general structure shouldn't cause too many problems when you are searching for the right bet. I've not encountered any difficult, but in all honesty I haven't spent a large amount of time at the Victor Chandler online betting shop. However, from my limited experience I have no complaints about the actual website itself. As with all of the online betting shops on this site, the support is great. 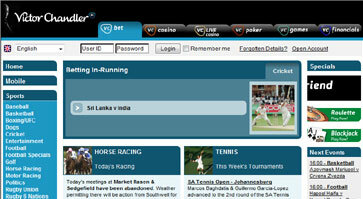 However, this is something that you should come to expect from any decent online betting website. VC is a big company, so you can be confident that they are well experienced with dealing with their customers and any problems or issues that you might encounter. You can expect a quick response from both the email and phone support contacts. The UK phone number is also freephone. One of the handy features (for some bettors) of VC Bet is that they accept very high deposits. Deposits via Credit/Debit card have no set limit, and you can deposit up to £50,000 through the popular online wallets. These are also available as withdrawal options, and the withdrawal limits are equally as high. VC would be recommended if you are looking to place very large bets. I would suggest you try Betfair instead unless you are looking to bet exceptionally large amounts of money online (£10,000 or more) at VC.